The Colony is located in Doogurt on the island of Achill. 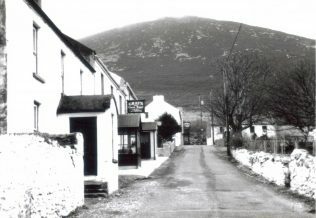 It is an old village at the base of Slievemore. It was established by a man called Edward Nangle, who was a Protestant. He was very influential in Achill as you will find out as you read on. But this was not the best thing that Nangle did for the island. 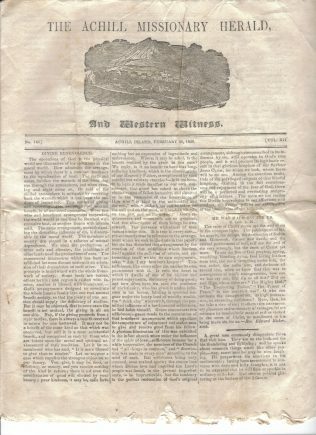 In 1837 he also set up a newspaper called “The Achill Missionary Herald and Western Witness”, partly describing what was happening in Achill. This paper brought a lot of publicity to Achill. It was supposedly printed using an Eagle Press. The original paper was 12 pages long (but eventually grew to 16). Each page was 28.7cm x 22cm with three columns per page. 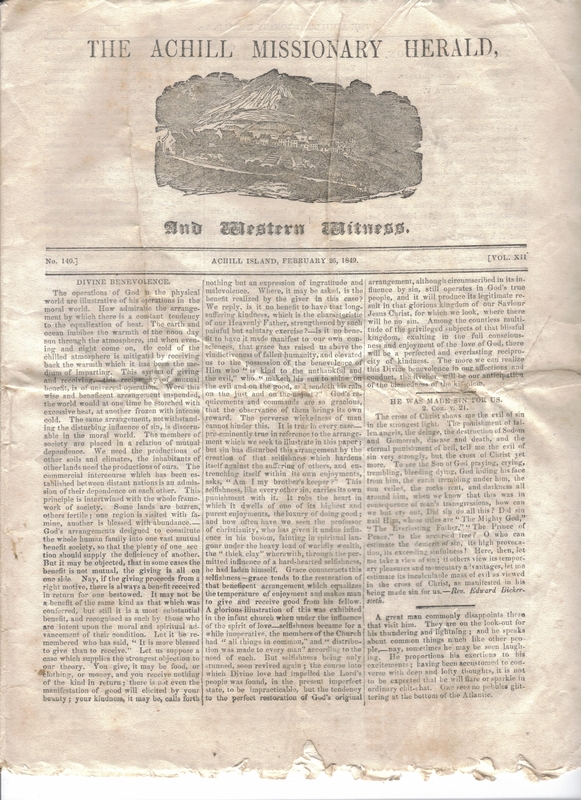 The newspaper was printed and published by Michael Daly and was distributed worldwide. Subscriptions were five shillings per annum with the money going to funding for the Mission. Nangle had rented 130 acres of land from Sir Richard O’Donnel who was the owner and landlord of the island. But eventually Nangle left and went to Skreen, Co. Sligo. The paper changed to become “The Irish Church Advocate” in 1870, then “The Church Advocate” in 1879. Rev. Edward Nangle died in 1883, aged 84. He did a lot for and brought lots of publicity to Achill. Some writers came to Achill and wrote about the Colony and Nangle, attracted by the newspaper while he was alive, or the history while he was gone. Mr. and Mrs. S.C. Hall and Harriet Martineau visited the Colony in Nangle’s time. But even more writers wrote about the Colony and Rev. Nangle. 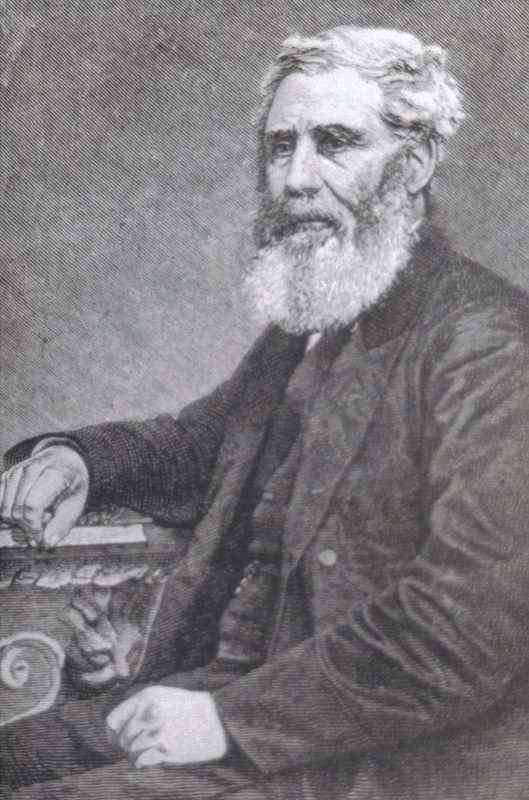 Henry Seddal wrote a book entitled Edward Nangle; The Apostle of Achill. The book was published in London in 1884. 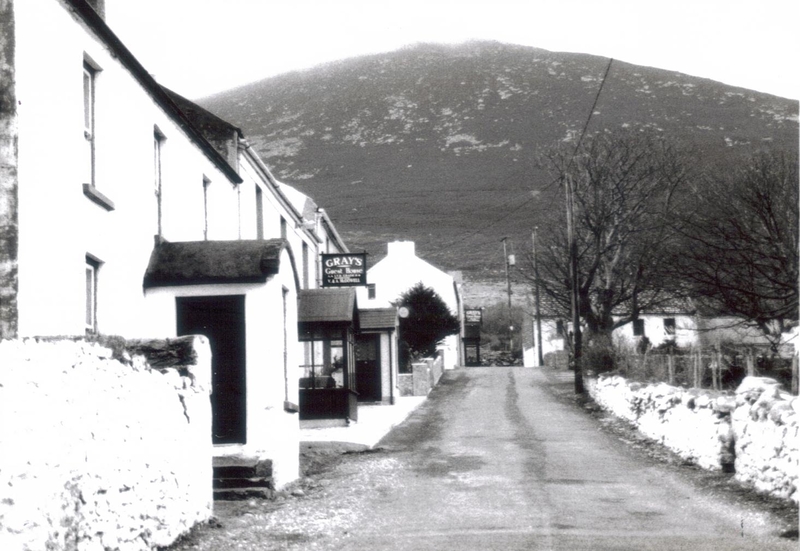 It tells us about Edward Nangle and his time in Achill. Another book that tells of Nangle’s time in Achill is Rev. P.J. Joyce’s A Forgotten Part of Ireland. The book was published in Tuam in 1910. Chapters 9 and 10 tell us in detail about Nangle’s influence in Achill. There are also short essays or pieces of information written about Nangle and the Colony that have been published such as “Edward Nangle (1799-1883), The Achill Missionary in a New Light”. It was written by Patrick Comerford and was published in Cathair na Mairt, No. 18 in 1998. Another essay, called “Edward Nangle and the Achill Mission 1834-1852” written by Irene Whelan, was published in A Various Country, Essays in Mayo History, 1500-1900 . But some writers actually visited the Colony, as well as wrote about it. The before mentioned Mr. and Mrs. S.C. Hall wrote a book called Ireland, Its Scenery, Characters etc. which contained information about the Colony. Aesnath Nicholson wrote a book which talked about the Colony called Bible in Hand, Ireland’s Welcome to Strangers. Charles Boycott also visited the Colony, and the book Boycott, The Life Behind the Word written by Boycott’s descendant, C.A. Boycott, describes his visit to the Colony and the Colony itself. Nangle also published some books, guides, etc. himself, including a copy of the Bible in Irish. There is no doubt that Edward Nangle helped make Achill the way it is today and that he was also a huge figure in literature and publishing. Excellent researched article…wonderful discripitve piece of The Herald. Nangle left a great legacy to the area. Well done on an excellent article about The Colony and the newspapers and writings associated with it.